“It’s only a matter a time”, said Javier Nuñez,* a Cuban government official in 2003 when the Bush administration just about carved out all permissible travel categories to Cuba. Not even a surviving war hero from the battlefields of Fallujah, Iraq would be allowed to visit Cuba to see his children before being sent back for another tour where he thought he would not return. I was inspired by Javier’s optimism. After all, his whole life existed under the U.S. Embargo against Cuba, a policy meant to snuff out the Castro government, but failed to do much other than hurt the Cuban people for 54 years. However on December 17, 2014 everything changed. President Obama and President Raul Castro made dual announcements to their respective nations at noon promising the U.S and Cuba would re-establish diplomatic relations and that Americans would find it easier to travel to Cuba. 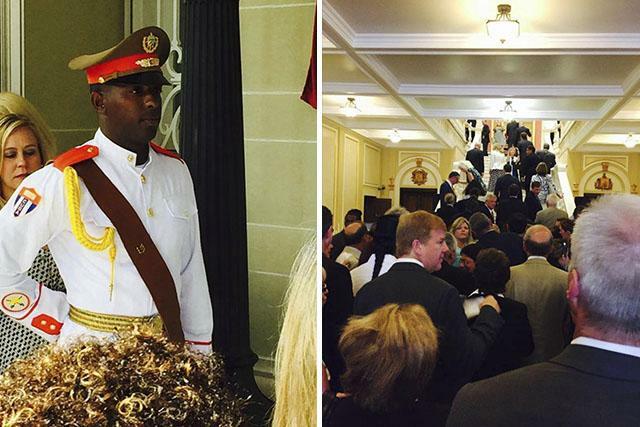 Cuba celebrated and the U.S. population took notice. Travel to Cuba by Americans started soaring. It was my distinct honor to be among the few invited to the official opening and flag raising ceremony at the Cuban Embassy. As we drove up 16th street, media outlets with lights, cameras and talking heads lined the sidewalks. As I entered the grounds of the once Cuban Interest Section, the lone flagpole, was waiting, as it had been for 54 years. The historical significance of the moment was imminent. Standing around me was a mix of personalities I never thought I would see together; Senator Patrick Leahy, members of Congress and U.S. State Department officials were standing amongst the former Cuban Vice President Ricardo Alarcón and other prominent Cuban officials. And then it happened. 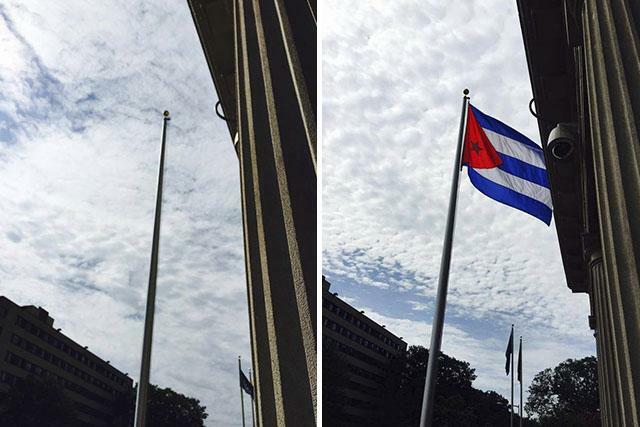 Ambassador José Cabañas along with members of the Cuban National Guard and U.S. Department of State Representatives raised the Cuban flag. After a 54 year hiatus, it was finally flying in Washington, DC. What followed was absolute elation, there was not to be a dry eye on the grounds. Everyone present understood the significance of the moment. 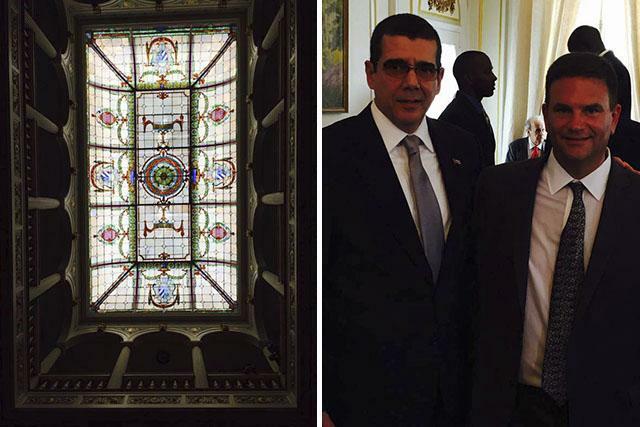 Seconds later, we were granted entry into the new Cuban embassy. Prominent politicians excitedly took photos and some, (I won’t say who) were even taking selfies as they entered. 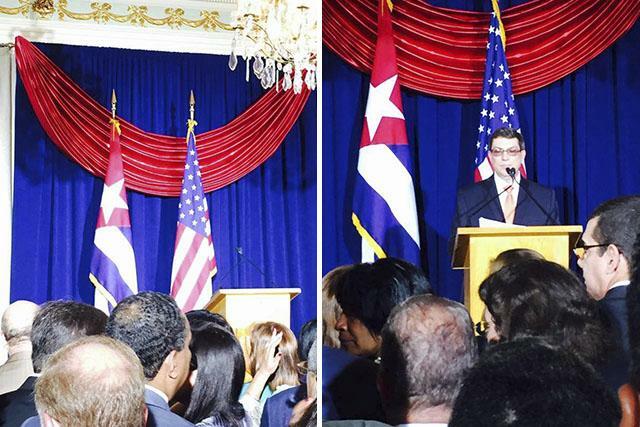 As we gathered in the ballroom, one couldn’t help but notice the Cuban and American flags standing side by side in front of the podium. One of many firsts that day. Tom Popper is president of insightCuba, a leading provider of legal people-to-people travel to Cuba. InsightCuba was the first to bring Americans to Cuba under this provision in 2000. The company has sent more than 12,000 Americans to Cuba legally.